Reinstalling Windows is an important strategy for any geek, and a useful skill for anybody who doesn’t want to pay one. By starting over with a clean copy of the operating system, you can remove bloatware, wipe out malware, and fix other system problems. A full, clean reinstall is different from the Reset your PC option in Windows 10 and 8, or a manufacturer’s recovery partition or disk for Windows 7. Those built-in options will set your PC back to its factory-default state—which could include some vendor-installed junk you never wanted anyway. A clean install uses the generic Windows installation media that you can download from Microsoft, and it’ll have just the OS, no other frills. 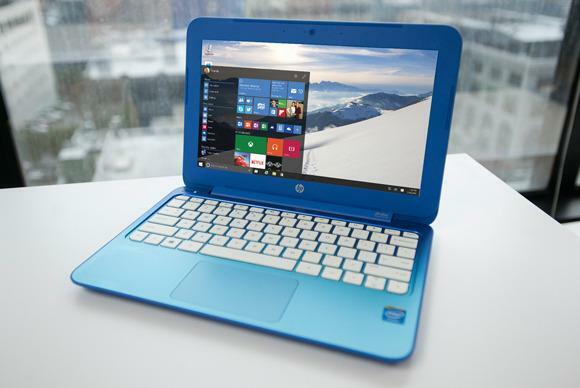 You shouldn’t need to regularly reinstall Windows to keep it performing well. But, if a computer is bogged down by startup programs, context menu items, and years of junk, reinstalling Windows may be the quickest way to speed it up again. Reinstalling Windows can also save a computer infected with malware or afflicted by blue-screens and other system problems caused by software issues. Before we begin, back up all of your personal data. While you should back up your data regularly, it is especially important to do so before reinstalling an operating system. 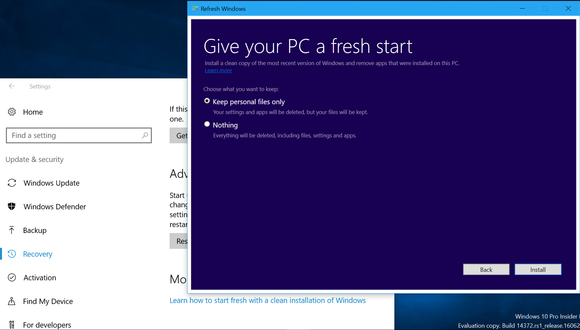 Windows 8 added ”Refresh your PC” and “Reset your PC” features that attempt to make installing Windows easier. Both of these options actually perform a Windows reinstall in the background, quickly installing a fresh Windows system from the recovery files on your computer’s drive, a Windows installation disc or USB drive. On Windows 10, this option is just named "Reset your PC". You can reset your PC and keep all your personal files and Windows Store apps, or reset your PC and wipe everything from your disc. Either way, you’ll have to install all your desktop programs again, but that’s the point: You get a fresh Windows desktop system with all your system files in a known-good state. 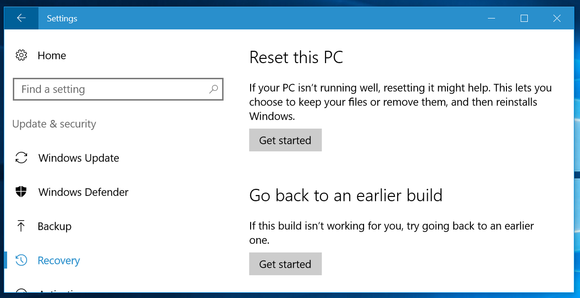 The "Reset this PC" option will reset Windows 10 to its factory default state. If you choose to erase everything, Windows can even wipe your system drive so no one can recover your personal files later. This is the easiest way to remove your stuff from a PC before getting rid of it. Resetting this PC will delete all your installed programs. You can choose whether you want to keep your personal files or not. On Windows 10, this option is available in the Settings app under Update & security > Recovery. Click or tap "Get Started" under Reset this PC. You can then tell Windows to "Keep my files" or "Remove everything." If your computer isn’t booting properly, it will boot to the advanced startup options menu, where you can select Troubleshoot to reset your PC. You can also access these options by booting from a Windows recovery drive. 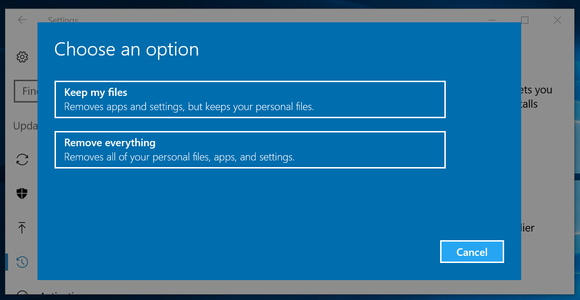 On Windows 8, both of these options are available in the modern PC settings app under Update and recovery > Recovery. In Windows 10's Anniversary Update, Microsoft is experimenting with a new "Give your PC a fresh start" tool that will allow you to reinstall Windows from here, erasing even all that manufacturer-provided junk. It should be just as good as installing Windows 10 from scratch. Look for a "Learn how to start fresh with a clean installation of Windows" option at the bottom of the Recovery pane after upgrading to the Anniversary Update. With the Anniversary Update, Microsoft may allow Windows 10 users to reinstall Windows 10 and remove the manufacturer-installed junk much more easily. In Windows 7 and previous versions of Windows, it’s up to the PC manufacturer to provide a recovery partition or recovery discs. Most manufacturers don’t include Windows installation discs with their computers. If your computer has a recovery partition, run your manufacturer’s recovery tool to reinstall Windows. On many PCs, you’ll have to press a key during the boot process to access the recovery tool. This key may be displayed on your screen. It should also be printed in your computer’s manual. If your computer comes with a recovery disc, you can also insert it in your computer’s optical drive and boot from it to begin reinstalling Windows. You’ll end up with the manufacturer’s like-new Windows system on your drive. All the original drivers will be installed, which is good, but all that nasty bloatware will also come back—that’s bad. You’ll have to remove unwanted junk software after you reinstall.